You are here: Home / Uncategorized / Sometimes I Am A Whiner. Sometimes I Am A Whiner. But, I don’t ever do anything the easy way – and besides, I needed a picture of the day. 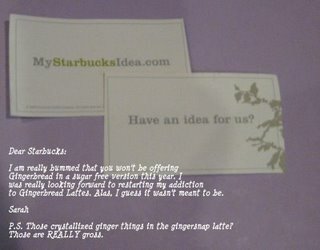 (You can click on it to make it bigger but it says: “Dear Starbucks: I am really bummed that you won’t be offering Gingerbread in a sugar free version this year. I was really looking forward to restarting my addiction to gingerbread lattes. Alas, I guess it wasn’t meant to be. Sarah P.S. Those crystallized ginger things in the gingersnap latte? Those are REALLY gross.” For the record, those suckers are supposed to melt, but don’t, and then you end up CHEWING your coffee. Nasty). My next step was to put my pic in my Flickr photo stream and then I Twittered the folks at MyStarbucksIdea (twitter.com/mystarbucksidea) to send them the link. MyStarbucksIdea: @SarahInMI Ha! So clever! Why isn’t everyone so clever? I then went on to ask if clever was code for obnoxious, to which they assured me that no, if I was obnoxious, they’d say so… and then a bit ago a post to me and another eager twitter-er letting us know they’d be checking in to the lack of sugar free options. Whoo! So, I guess the moral of the story is, if you need to whine, you should totally do it with arts and crafts. Thank you! That’s the first time I’ve laughed in HOURS!